6-12 May | Six days to celebrate Scotland’s quality childminders and one Wild Day Out! Each year, this award-winning event is always a massive success, we want Childminding Week 2019 (6-12 May) to be bigger than ever! This is another important year for childminding in Scotland and we need all of you to #CheerforChildminding, raise the profile and improve recognition of childminding. It's vitally important that childminders are recognised more widely as a valuable part of the professional childcare workforce. After all, you are already providing high quality, flexible care and learning experiences for more than 30,000 children across Scotland. We want you to get excited, have fun and celebrate the fantastic work you do for your minded children. Join the Childminding Week conversation and #CheerforChildminding by sharing your activities and fun ideas with us. Become a Childminding Week 2019 Champion and share your photos, stories and adventures with us between 6-12 May and we'll share them across Scotland...and you could WIN! Do you remember our cuddly tiger mascot Roary that you named for Childminding Week back in 2017? Well, he’s back, and ready to #CheerforChildminding once again. 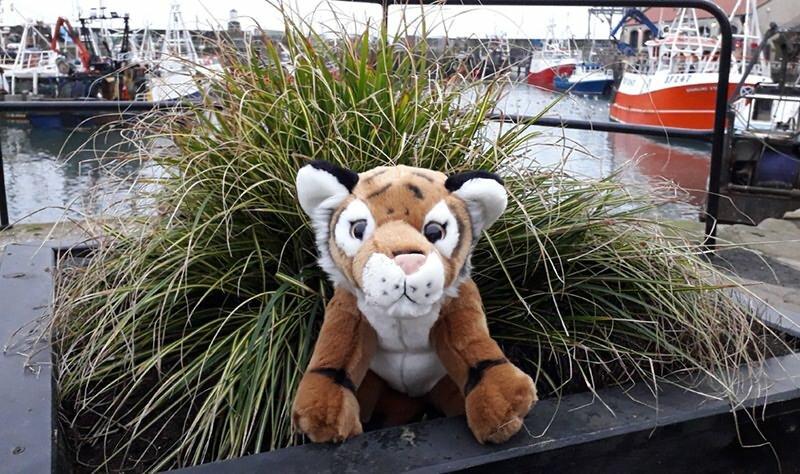 After a long break away visiting some relatives in the Mangrove region of India, Roary is back in Scotland and is counting down to biggest Childminding Week celebration ever! He’s been all across Scotland visiting and sharing some of his highlights and telling us what he’s been up to. We want to hear you roar…just like our Roary! So, this year we’re asking you to film you and your minded children lip-syncing to Katy Perry’s hit song ‘Roar’ and use the hashtag #HearMeRoar and #CheerforChildminding to celebrate during Childminding Week 2019. Plus, you could win a Childminding Week Goody Bag! If we all cheer together, we'll make a bigger noise! Whether you’re part of a large childminding group hosting a Childminding Week funday, or a solo childminder taking part in a special messy play activity within your setting – this is your chance to shine and #CheerforChildminding. •	Childminders stimulate children's learning, development and wellbeing, helping them to achieve their full potential and ultimately close the attainment gap for Scotland's children. •	Childminders encourage children to learn, grow and develop as they experience the world through everyday activities, whilst socialising with their peers in small groups. •	Childminders offer quality flexible childcare options, tailored to each child and their family’s individual needs to benefit their overall wellbeing. •	Childminders provide a constant support to families and children through transitions, providing a 'seamless' day for children. Security, stability and consistent care are key. Sunday 12 May is Childminding Day and for 2019, we are going to Blair Drummond Safari and Adventure Park near Stirling for a really wild day out! All SCMA members, their friends and family are invited to Childminding Day for a fantastic, fun day out, to celebrate another successful year and to #CheerforChildminding. SCMA members will receive six Childminding Day 2019 tickets inside their spring issue of Childminding magazine. Members can also request up to a maximum of 36 additional tickets by calling SCMA Head Office on 01786 445377 before Wednesday 8 May. Safari Park entry entitles all visitors to all attractions, presentations and displays within the park, including the Chimp Island Boat Trip, Sea Lion Presentations, Bird of Prey Displays, ‘Meet the Keeper’ Talks, the Giant Astraglide Slide, Pedal boats, the Flying Fox Zip Slide and much more! Childminding Day 2019 ticket holders can also join us and in the exclusive SCMA Childminding Day VIP Marquee, where we will be hosting lots of free entertainment and activities throughout the day, including free face-painting, magic and fun with Magic Gareth, dance and sing with Central FM, set off on a treasure hunt and pose like a pro for Selfie Madness...plus much more! Read, share, amaze, play and use your imagination for Childminding Week 2019! In line with our national priorities and hot topics, we've come up with themes for each day of Childminding Week (6-12 May) to help you incorporate them into each day's activities. Incorporating these key elements into fun and engaging experiences for your minded children, will help to benefit their development, wellbeing and stimulate their learning. Sunday	Childminding Day	Celebrate Childminding Week 2019 with a Wild Day Out! Here’s a great idea! Why not design a superhero for Childminding Week, create a story of their adventures and take turns to share it with everyone in the group. Childminding Week is your chance to shine, become a Childminding Week 2019 Champion and #CheerforChildminding. Email, Facebook or Tweet us your photos during Childminding Week (6-12 May) and we’ll share them across Scotland.